Hack to Fight Online Violence: Media Matters for Democracy and Code for Pakistan to host a ‘Hackathon’ at APrIGF Bangkok to improve on ‘Muavin’. Join us! Where: Workshop Room number 22 at Chulalongkorn University, Bangkok, Thailand. Are you a coder and interested in developing civic tech? Would you be participating in APrIGF 2017 in Bangkok? We need your help! 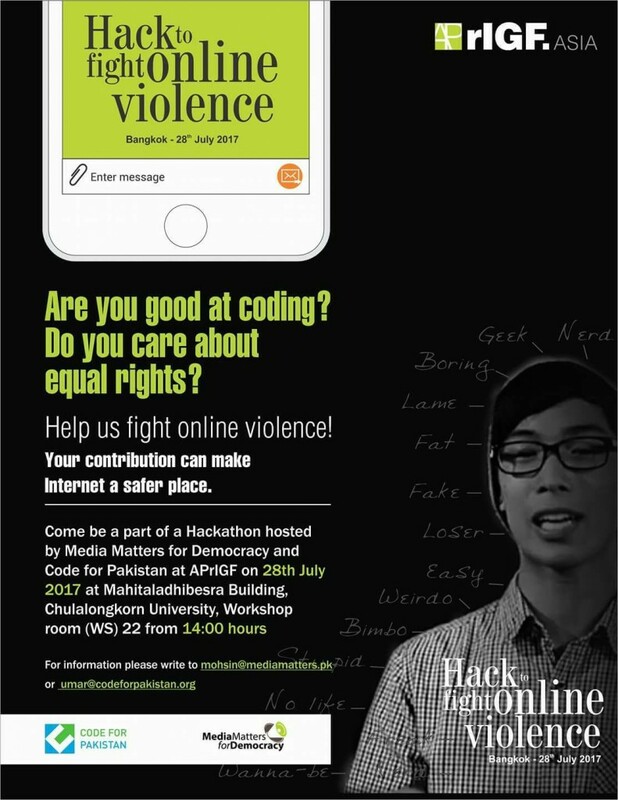 Media Matters for Democracy and Code for Pakistan invites you to participate in a ‘mini-hacktahon’ that we are hosting at the APrIGF 2017 in Bangkok on the 28th of July in WS22 from 1400 to 1550 and contribute in pushing back on online harassment. The session aims to bring together thematic experts and coders to present ideas to improve Muavin, a digital tool developed by MMfD and CfP aimed at pushing back on online harassment. Muavin will be launched in Islamabad in August 2017. See you all at the hackathon!